In 2009 my aunt rediscovered some letters and souvenirs from her childhood in the 1940s. She and my mother had been the mascots of a fishing boat that had been commandeered by the Royal Navy at the start of World War II for use as a minelayer/patrol boat in the North Sea. My grandparents lived in Norwich and the trawlers were working out of Lowestoft. The girls had knitted gloves for the crew and received letters and keepsakes from them. Rediscovering the story recently, it set us all off and we started digging. The trawler was called the River Spey and had been built by the Admiralty in 1918. The Navy had commandeered fishing boats in that World War I too and with so many being lost had begun a programme of building their own. 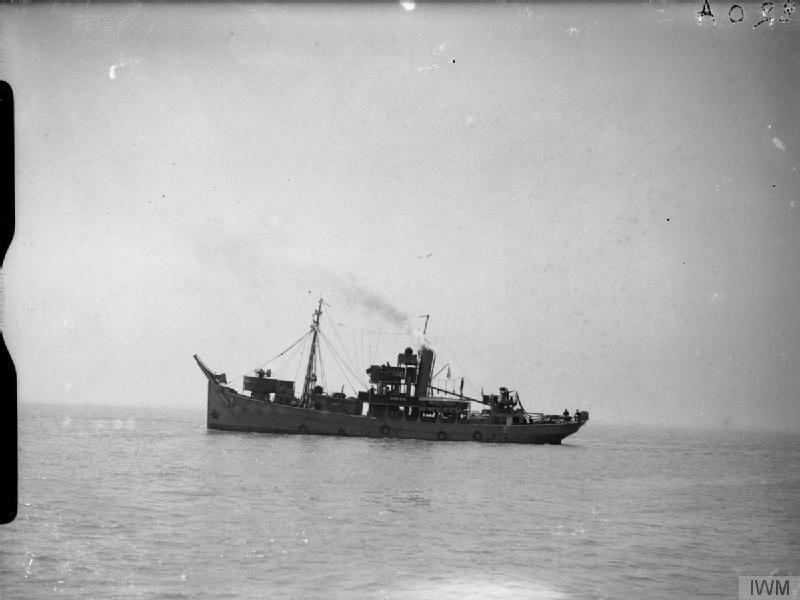 They were fitted with guns and minelaying equipment but were otherwise normal trawlers that could be stripped of their armaments and sold off at the end of hostilities. Unhappy with calling them HMS this or that they were christened His Majesty’s Trawlers – HMT. Their names were also a problem. They could not be named after captains or admirals after all! Instead they chose to use the names of members of the crew of HMS Victory and HMS Royal Sovereign at the Battle of Trafalgar. 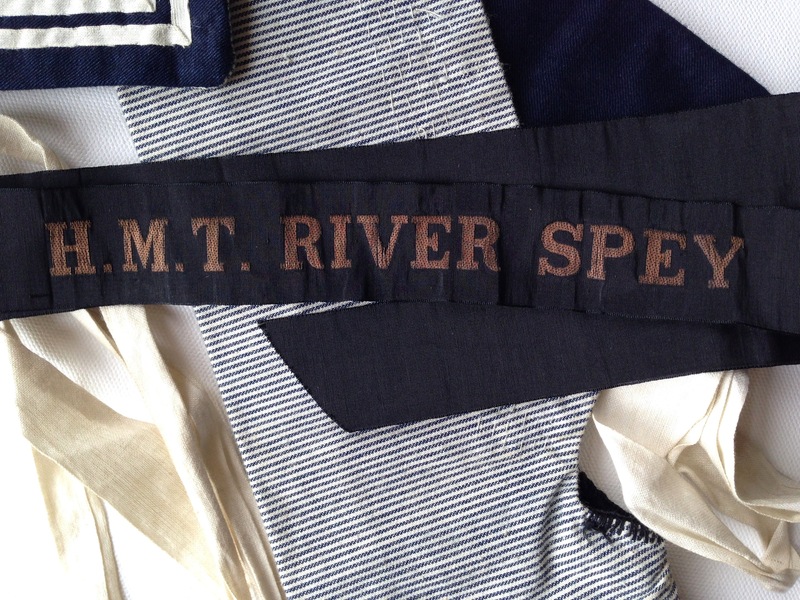 River Spey started life as HMT David Conn, named after a 24 year-old ‘landsman’ on the Victory. She never saw military service and her later name was given by the fishermen who bought her from the Navy in 1919. In World War II trawlers were again called up for naval duties. 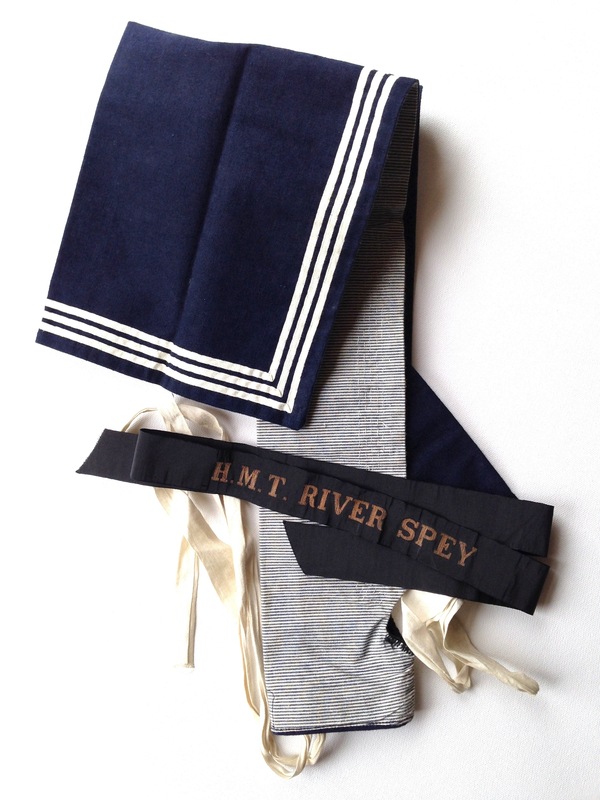 In May 1940 River Spey was rearmed and fitted out as a minesweeper and became HMT River Spey. Almost immediately the crew would have been dispatched to Dunkirk. As a first experience of naval service it must have been a frightening way to start. She served in the North Sea on minesweeping and anti-submarine duties with the Royal Naval Patrol Service throughout the war and survived to be returned to the fishing fleet afterwards. 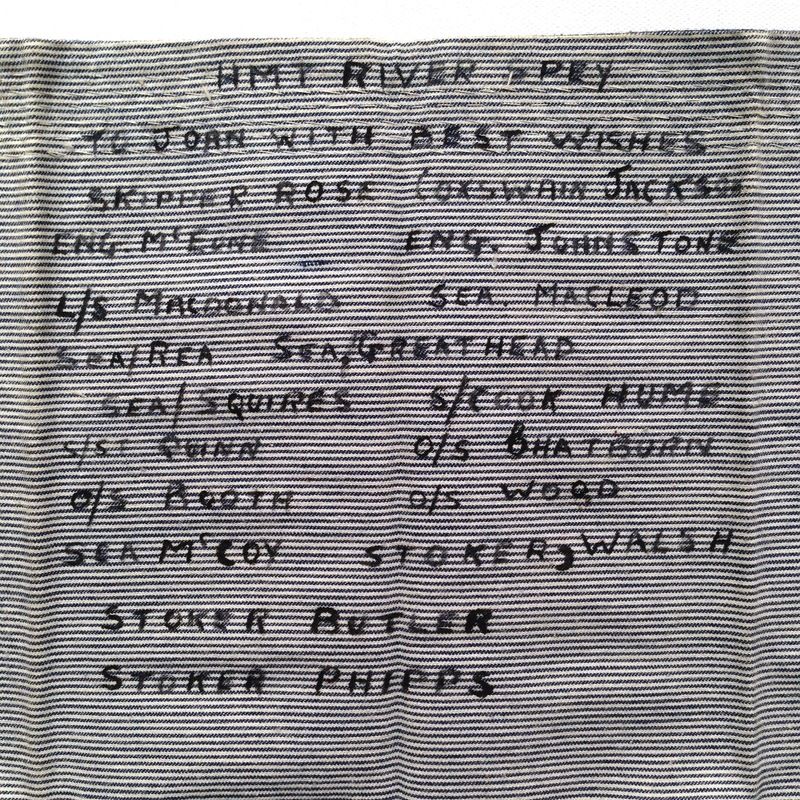 Her crew varied over time but some time in 1940-41, they sent my aunt and my mother a seaman’s uniform collar each as a gift with their names written inside. Undated photo of HMT River Spey. 1941-45. The projection on the bow is equipment for detonating acoustic mines. Imperial War Museum © IWM (FL12374). It is apparent that the crew enjoyed writing to the children and some continued to write long after being posted elsewhere. They girls sent supplies of knitted gloves and such like and received grateful thanks and both sides asked for and received photographs to pin on the wall. The crew made toys and sent souvenirs like the collars above and an ensign flag. They rarely discuss events of course and there is no detailed record of her experiences. In between the lines, and occasionally directly, some of the realities creep out. After the death of one of the crew whilst serving on another trawler, the Skipper fails to hide his emotions. They are proud of serving at Dunkirk and later make light of the trawler being in dock for repairs for several weeks (having clearly taken a beating). Managing to crash into the sea and stay afloat long enough to get the crew into a dinghy is pretty remarkable. To be found quickly and lose no one is more so. Although Elliott was awarded a DSO, the crash and rescue is not documented in the official records nor is there any mention of it in my mother or my aunt’s letters from the crew. In practice combat aircraft losses were recorded – the reconnaissance aircraft were not because their missions were considered secret. I have picked up one reference to Elliott and his men and the River Spey in a wartime diary – met celebrating in a Cambridge pub the following day! The writer recalled them talking about being rescued by ‘SS River Spee’. Elliott soon after moved to 83 Pathfinder Squadron at Scampton where he christened his new Avro Lancaster (OL-E P5669) ‘HMT River Spey’ in honour of the trawler that saved his and his crew’s lives. I don’t suppose many bombers were names after old trawlers! The Lancaster HMT River Spey was later damaged in a crash-landing at Scampton, repaired, and reallocated to another squadron. She was shot down over Berlin in 1943. 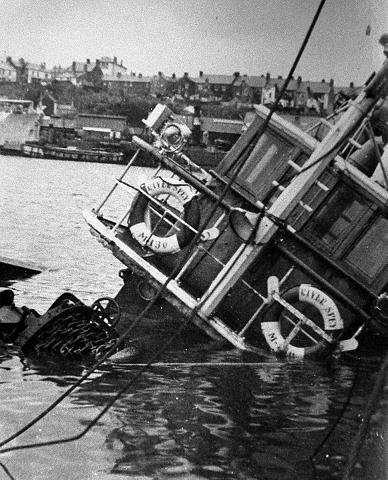 The trawler HMT River Spey returned to the fishing fleet in 1945 and sailed from Aberdeen and later Milford Haven where she sank at her moorings alongside the fish market on 16 Jan 1955. Raised with some difficulty she was eventually scrapped the following year. She wouldn’t go quietly and made the front page of the Milford Haven and District Reporter in the process. It is quite a story. Various things recur but particularly the need to record, remember and celebrate. David Conn and the crew of the Victory; the need for a mascot for the trawler; the letters and autographs sent to my Aunt; the photographic expedition; the celebration in the pub in Cambridge and the naming of the plane each represent points at which this happened. You can of course draw out other things and the story of the wartime trawler fleet in the North Sea is a grim one (a good source is Paul Lund and Harry Ludlam’s book Trawlers at War, London: Foulsham, published in 1971).